A discovery that variation in "receptive joint attention," or the ability of chimpanzees to follow another's gaze or look in the direction someone is pointing, has a genetic basis that could provide insight into autism spectrum disorders. Following another's gaze or looking in the direction someone is pointing, two examples of receptive joint attention, is significantly heritable according to new study results from researchers at the Yerkes National Primate Research Center, Emory University. Determining such communicative cues are significantly heritable means variation in this ability has a genetic basis, which led the researchers to the vasopressin receptor gene, known for its role in social bonding. 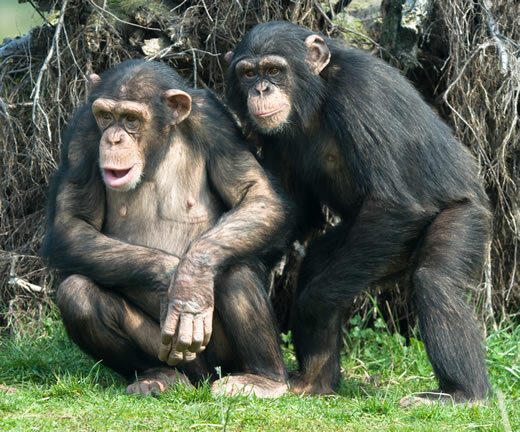 "We used chimpanzees in this behavioral study because their receptive joint attention abilities are well documented and their closeness to humans makes the study results the most likely to be generalizable to humans," says Hopkins. Young's previous research in which he showed the vasopressin receptor gene was necessary for remembering individuals (or social memories) and for social bonding in male rodents was key to designing the current study. According to Young, variation in the length of a stretch of repetitive DNA, known as junk DNA, in the control region of the vasopressin receptor gene predicted if a male prairie vole was likely to form monogamous bonds with a mate. Human-based studies suggest that a similar repetitive element, referred to as RS3, in the control region of the human vasopressin receptor gene predicts romantic relationship quality and generosity. "Male chimpanzees with the human-like RS3 sequence displayed higher levels of joint attention and, therefore, needed fewer social cues to elicit an orienting response in the same direction as the experimenter than those missing the sequence," says Hopkins. "There was no effect of this gene in female chimpanzees, consistent with the vole and human studies in which the vasopressin gene specifically affects male social behaviors," Young adds. A previous study by Hopkins and his M.D. Anderson-based colleagues found male chimpanzees with the human-like RS3 sequence were more dominant than males lacking the RS3. Hopkins and Young speculate this dominance may be achieved because the males with RS3 are more socially competent at reading communicative cues of others. "They are more socially savvy and, thus, may be more likely to negotiate social hierarchies more efficiently," says Hopkins. "The unusual genetic variation in the RS3 of chimpanzee vasopressin receptor gene makes chimpanzees an excellent animal model for exploring the role of the vasopressin receptor on social behaviors and, hopefully, translating our findings to humans," says Young. "We can provide insights into the evolution of human social behaviors, and because of the similarities between chimpanzees and humans, we can work toward better understanding the role of biological mechanisms and how they influence cognitive and communicative abilities of primates, including humans," Young continues. The team's continuing work will include more sophisticated behavioral studies as well as exploration of the contribution of the oxytocin receptor gene on social behavior and cognition in chimpanzees. Within the fields of microbiology and immunology, neurologic diseases, neuropharmacology, behavioral, cognitive and developmental neuroscience, and psychiatric disorders, the center's research programs are seeking ways to: develop vaccines for infectious and noninfectious diseases; understand the basic neurobiology and genetics of social behavior and develop new treatment strategies for improving social functioning in autism and schizophrenia; interpret brain activity through imaging; increase understanding of progressive illnesses such as Alzheimer's and Parkinson's diseases; unlock the secrets of memory; treat drug addiction; determine how the interaction between genetics and society shape who we are; and advance knowledge about the evolutionary links between biology and behavior.